Happy Fourth of July, friends! May your day have sparklers and smiles and s'mores. Fireworks and fiestas. The sand between your toes. I need this hexie to get through to my toddler. In my house, vegetables only get eaten if they are "pickles" or "bouncy beans" (a reference to the kids show Julius Jr. that she watches incessantly). Hitting the beach with the family this Fourth of July weekend. Here's a sandy playground hexie for your holiday! You get a three-for-one deal on this post. I won't lie, I'm pretty sure I picked up this fabric because I liked that there were several different images in rows. I fussy cut enough tomatoes, beets (or are they radishes?) and eggplants for a block apiece. When you're making 600 of these things every extra bit of yardage you don't have to buy anew helps! On an almost related note, you've seen Coneheads, right? One of my very favorite movies. My favorite moment is Jane Curtin walking up to the display of eggplant in the grocery store. I'm giggling now just thinking about it. If you haven't seen it, rent or Netflix it now! Thought I should sneak this one in today before Pride Month is over. Happy Pride! A little flora to brighten your day. I think this hexie was a bit of rayon from a garment. It was a little tough to wrangle but has such a nice hand worked up. It's one of those fabrics I love finishing a project in! The kid is big into sidewalk chalk these days. I took advantage of my decorated front step for this hexie. I cut my Lisbon in a straight size 18, long sleeves and regular length. I skipped the buttons for an open front cardi and instead of using lace as an accent cut my fronts out of some long hoarded, totally adorable, dachsund fabric from Girl Charlee. Since it was a test and I was still learning my serger I basted everything on my sewing machine first using a straight stitch, 4.0mm. This actually worked out really well because I could be more exact with the seam allowance on the sewing machine and then had a sewing line to follow on the serger rather than eyeballing how far past the blade my edge should be. Plus it meant that I didn't have to worry about pins anywhere near my serger (a serger will cut through a pin, but it'll nick the blade and it's expensive to have that replaced). I ended up having great seam matching and only having to pick out one or two little pleats. My sweater fits really well and is so comfortable it actually took me a few extra hours to finish because I was too interesting in wearing it, even before I had time to attach the cuffs! Speaking of the cuffs, I learned a good trick for serging in the round: cut two slits into the seam allowance about a half inch apart, about 1/8" from the seam line. Cut out the small piece of fabric between the two slits. Lift the presser foot of your serger and line it up so that the blade fits into the cut out notch. Start serging as normal and serge over the starting stitches when you come around the circle and sew in your thread tail as normal. Voila! There were only two things I would keep in mind as I sew: 1) I shortened the sleeves by 2.25". I know Kennis is shortening the sleeves by .75" in the final version and I used a slinkier main fabric than I might use in the future. On my next one I will cut the sleeve out as patterned on the final version and then shorten as/if necessary once attached to the body. 2) Make sure when you cut your interfacing that the stretch of the interfacing aligns with the long edge of the front bands. If you use Pellon interfacing like I did, be aware that the stretch is selvage to selvage so you might want to cut a few smaller crosswise strips and overlap instead of one longer strip that doesn't take advantage of the stretch of the knit. I think my next one (and there will certainly be a next one!) I'll add length and some patch pockets. If I'm feeling adventurous maybe even try my hand at hacking a v-neck so I can make myself the consulate grandpa cardi! You can get your copy of the Lisbon Cardigan pattern here. Normally $10, Lisbon is on sale for $8 right now. If you buy 2 or more patterns you get 15% with code savemore15. Both sales are good through Monday May 9. If you make a Lisbon, let me know, I want to see your makes! Please note that some links are affiliate links. If you buy a pattern from Itch to Stitch after clicking one of my links I get a commission but there is no increased cost to you. I love me a good geometric design. Don't have much to say about this one but I really like it just the same. It's really strong and graphic and a nice, rich purple. I'm pretty sure the fabric is from Jo-Ann Fabric. I just couldn't resist the pun of taking a photo of my matches hexie on the grill. I may have taken one with a fireworks hexie too. It may not be summer yet but I'm loving that it's at least warm enough to be outside grilling. This is another fabric from Meghann (also from my Roadtrip Case). I don't know the fabric line or manufacturer. The stuff is so damn soft (but not thin, which is incredible. I feel like every nice, soft cotton is borderline sheer.) I'm stuck between wishing I knew who made it and being grateful that I don't since my wallet would be way lighter if I did! I guess I couldn't resist the pun when I shot this one. Even hexie fungi grow on trees, apparently. This fabric came from my friend Meghann as an extra with a bag swap. She made me an awesome Road Trip Case that I use for storing knitting needles (double points) and crochet hooks in the spare moments when my kid hasn't decided that it's the perfect suitcase for her and that my hooks are ideal for banging on every surface she can find. She even sent me the leftover fabrics from that project that I (of course,) hexified too. 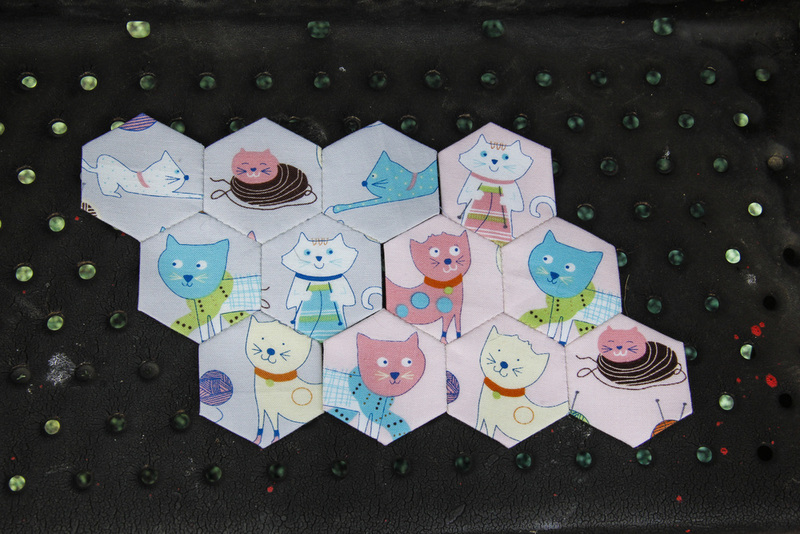 I blogged the block I made from the main fabric back in August. 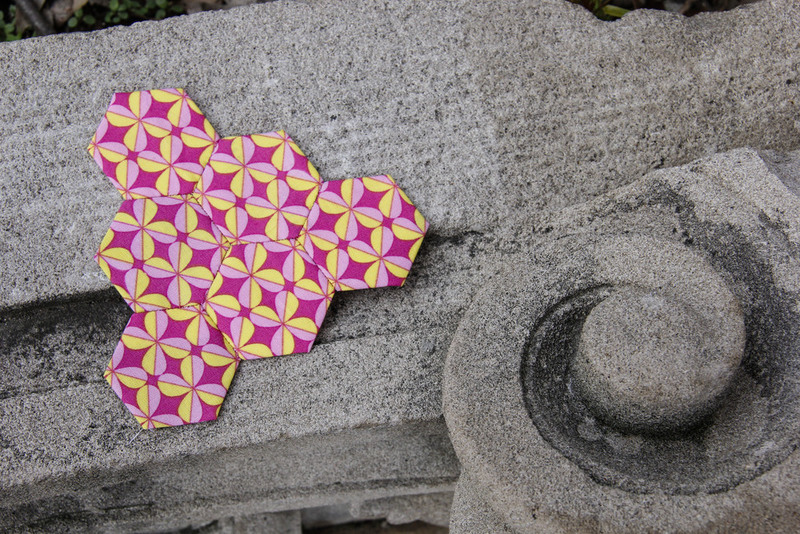 This hexie reminds me in equal parts of marble notebooks, Lisa Frank and the Save By the Bell theme. It's true color is exactly that late 80's/early 90's purple you're picturing in your head. I managed to shoot it at a time of day when the color got a bit washed out. The more of these blocks I make, the more I've begun to appreciate the solid or blender fabrics. They're not particularly exciting to make, but they're simple. There's no problem if the template shifts, no vertical lines to get just right, no graphics to center. Plus, in a batch of blocks they give your eyes a place to rest. Maybe I'll try to go with some less busy fabrics for my last 150 or so blocks. There's a playground a few blocks from my house that I like to take my daughter to. In our neighborhood we pass the planters built into the sidewalk that you see in cities surrounding trees. On our way to the park, one planter has a little something special. I'm not sure where it's from, but at some point someone put a piece of a fancy sculpted facade by their tree where the bricks had broken. Walking by it always makes me happy. Beauty in unexpected places. I like the hexie too. The pattern reminds me of orange peels. My daughter likes to pick this one out to tell me "This one my favorite!" She loves to go through my box of finished blocks and tell me all about the things she sees, the ones she likes best. It's quite a nice feedback loop for me! I couldn't resist shooting this one at the playground. 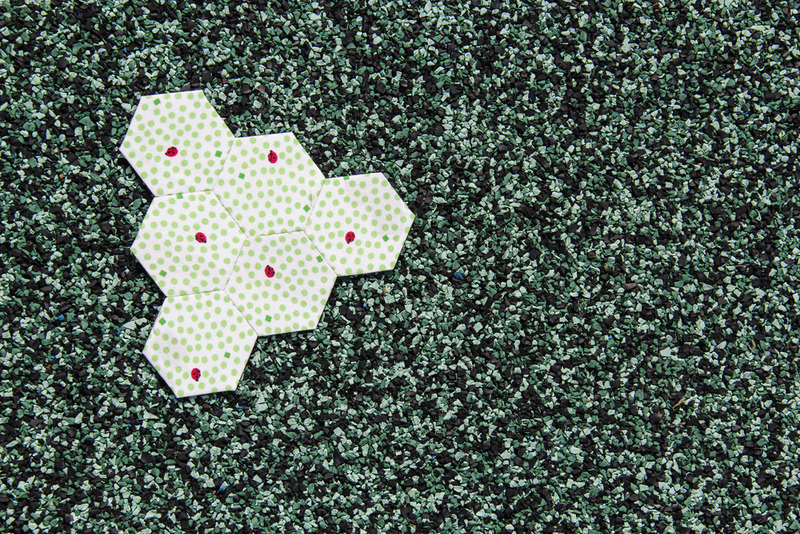 It's got that lovely flooring made from recycled rubber and it reminded me so much of the green spots on this block. Yesterday was the first day of spring... and it snowed! At any rate, hope for real spring weather springs eternal (hah! I think my husbands' propensity for dad jokes is rubbing off on me.) This fabric is a lovely Japanese cotton I got in a scrap bag from a friend. At least not anymore! The fabric from these hexies came from a shirt that had been in heavy rotation but needed an update. It was a babydoll style tunic that was just too long to look anywhere near decent on me. So I chopped a few inches off the bottom and rehemmed it. It was princess seamed and had two coordinating fabrics, one in the center and the other down the sides. And like any cotton woven fabric in my house, it went straight to the hexie pile! It’s been a while again. Sorry about that. I think I got a little bogged down in the need to tell a story about each block. Knowing that I had 600 ahead of me got a little daunting! In the meantime I started using Instagram in earnest (you can find me as @knitsmcgee). I really like the platform. 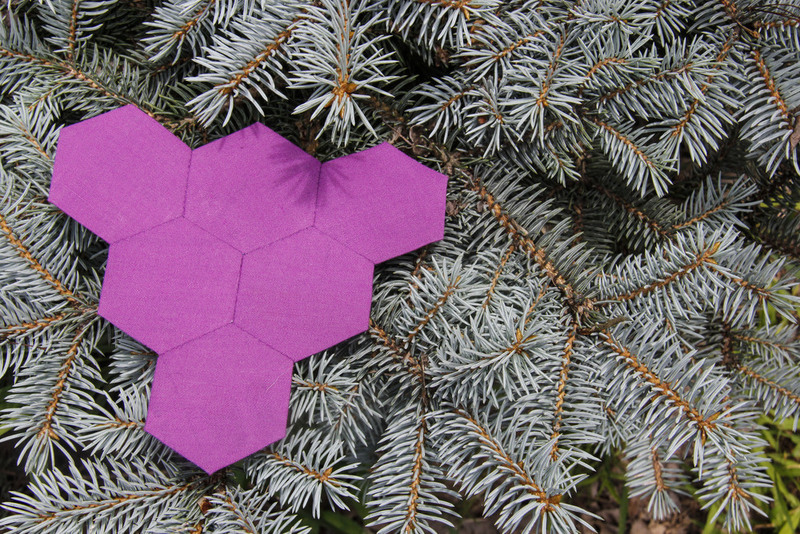 It made me reevaluate my approach to blogging the hexies. I think in the future I’ll steer more towards shorter posts and more content! My toddler insisting on being in my photo shoot. It's a good thing my little photobomber is cute. A little dancing action to show off those princess seams! The yoke is double layered so all the seams are enclosed. Next time I think I might try a lace or eyelet to make things a little more exciting. It's a purple kind of day. I'm wearing a dress I made (True Bias Southport maxi in Atomic Influx Perse from Art Gallery Fabric). I met up with some friends to use a free pass to the Philadelphia Art Museum before it expired. I'm still riding high from their compliments on it, especially my super stylish friend who works at Urban Outfitters headquarters. She told me that purple is a great color on me. As soon as I saw it I knew this hexie was the one. It's the same color as my dress!